Hi, I'm Jess of Champagne Thursday. 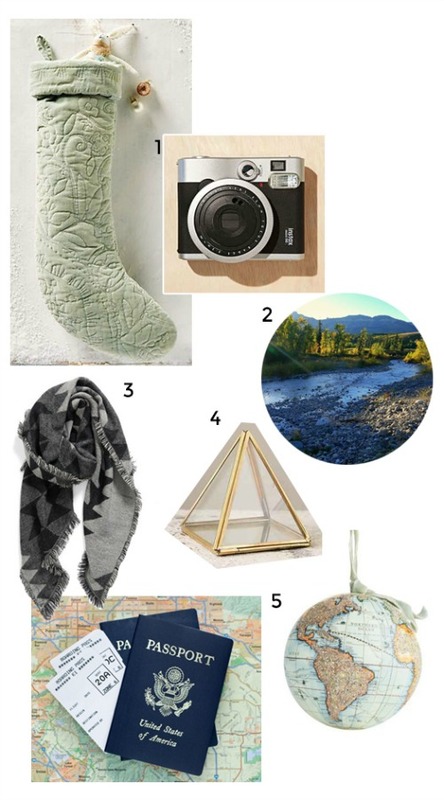 I love to explore new places, so I filled my stocking with things inspired by wanderlust! 1. A fun instant camera: I love the throwback design, and the pictures are great momentos. 2. America has breathtaking national parks. A donation to National Parks Conservation Association helps to keep these treasures preserved for generations to come. 3. A scarf is a travel essential, and this one is neutral without being too boring. 4. I love to collect little things, like seashells or pebbles, on my adventures. This pretty box would be a perfect way to display them once I'm home. 5. How to fit the world into a stocking? A plane ticket! If your budget isn't limitless, then this globe ornament works too. Thanks, Jess! Visit Champagne Thursday, and follow on Instagram and Twitter. Oh your annual stocking posts have started! Beginning to look a lot like Christmas :) I love these picks a lot! Anything that involves the fantasizing of travel is grand with me. I am always collecting little things like that on my travels, too - that pretty triangle / box would go great on my bookshelves!